“There is no season when one is not surrounded on all sides by victuals. The Neapolitan not only enjoys his food, but insists that it be attractively displayed for sale. In Santa Lucia the ﬁsh are placed on a layer of green leaves, and each category-rock lobsters, oysters, clams and small mussels-has a clean, pretty basket to itself. But nothing is more carefully planned than the display of meat, which, since their appetite is stimulated by the periodic fast day, is particularly coveted by the common people. In the butchers’ stalls, quarters of beef, veal or mutton are never hung up without having the unfatty parts of the ﬂanks and legs heavily gilded. Several days in the year and especially the Christmas holidays are famous for their orgies of gluttony. At such times a general cocagna [cuccagna, feast] is celebrated, in which ﬁve hundred thousand people vow to outdo each other. The Toledo and other streets and squares are decorated most appetizingly; vegetables, raisins, melons and ﬁgs are piled high in their stalls; huge paternosters of gilded sausages, tied with red ribbons, and capons with little red ﬂags stuck in their rumps are suspended in festoons across the streets overhead. I was assured that, not counting those which people had fattened in their own homes, thirty thousand of them had been sold. Crowds of donkeys laden with vegetables, capons and young lambs are driven to market, and never in my life have I seen so many eggs in one pile as I have seen here in several places. The constant presence of baleful Vesuvius on one side of the landscape and Herculaneum and Pompeii on the other seems like an eternal memento mori, leading to a unique philosophical depth. Here the soil is saturated with volcanic lava, a remnant of catastrophic disasters, but it also contains a rich natural fertilizer: seaweed. On this fertile ground, ﬂavorful vegetables and fruit are grown, redolent of the sea and of the volcano: artichokes, apricots, apples, white ﬁgs, and incredible lemons. A particular variety of local tomato in Campania is the San Marzano, which is grown on vast farms and supplies a thriving cannery industry. It was in Campania that tomatoes began to be cultivated sooner than anywhere else in Europe, and Naples has created many signature dishes with them: everything here is drizzled with tomato sauce. The fruit of Campania constitutes a third of all Italian fruit production. In addition, durum wheat, essential for the production of pasta, is grown here. Campania also specializes in water buffalo breeding. Up until relatively recently, a marshy strip extended along the coast, from Rome to Naples. Those swampy areas were drained during Mussolini’s dictatorship, but up until then, since it was impossible for cows to graze there, the inhabitants of Campania raised buffalo, which happily browsed on the sedge in those wetlands ﬂooded by rivers. Buffalo in fact love to live in wet environments (they are often pictured in the paintings of Asian artists, in the midst of tropical landscapes). For this reason, there was no cow’s milk in Rome or in Campania, only buffalo milk. Though this milk is not good raw, a wonderful masterpiece, a miracle of nature, is obtained from it: mozzarella di bufala, with all of its variants and subspecies (ciliegine, bocconcini, aversane, trecce, treccine, cardinali, scamorze, provole). Everything involving the production of mozzarella is, of course, regulated: the process, the recipe, the weight. The ciliegine (”cherries”) are little balls of twenty-ﬁve grams. The bocconcini(”morsels”), balls of ﬁfty grams. The aversana, on the other hand, must be very large: ﬁve hundred grams. According to a widespread conviction, mozzarella cannot be exported or stored, but should be eaten immediately on the spot, on the day it is made. However, since enthusiasts of true mozzarella live everywhere, not just in Naples, a way of satisfying their demands had to be found, without departing too much from the canon. At ﬁve in the morning, no matter what the weather, at the terminal of the regional wholesale market (Via Mecenate), Milanese fanatics of real mozzarella wait for the refrigerated trucks that come from Campania after a night’s journey. Even high-quality industrial mozzarella is good, of course: the kind sold in supermarkets in plastic bags, in its own preservation liquid whose salinity is similar to that of tears. Truthfully, though, it is not exactly the same thing. Everyone knows that mozzarella should be eaten in the shortest time possible. To prolong its life at least a little, mozzarella (that is, Provola, its most solid variety) is smoked. It then assumes a dark brown coating, while the center remains bright and white. It is better to eat mozzarella in its natural state, but sometimes it is prepared in carrozza (”in a carriage”), between two slices of bread whose crust has been removed: the whole thing is fried in butter after being ﬂoured and dipped in egg. Mozzarella dominates Caprese cuisine. Since life on Capri is the height of earthly luxury and indolence, no one should spend hours at the stove, cooking. Thus the cuisine on Capri is light and spirited. The mozzarella balls are cut into round slices; large tomatoes are similarly sliced into rounds; basil leaves, sea salt, a pinch of oregano, and black olives are added; and extra- virgin olive oil is poured crosswise onto the colorful dish. It is dinner, it is lunch, it is divine grace-call it whatever your romantic fantasy suggests, but if nothing comes to you, the technical name of the recipe is insalata caprese(Caprese salad). 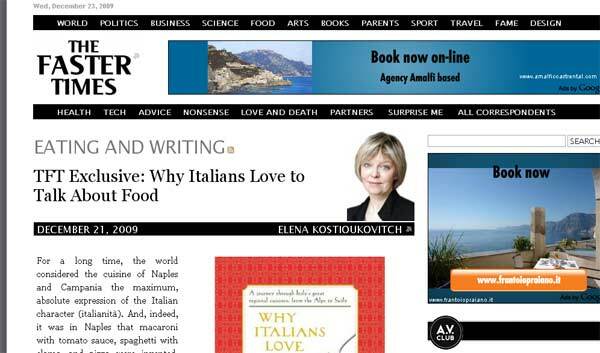 Excerpted from the recently published: Why Italians Love to Talk About Food by Elena Kostioukovitch; Translated from the Italian by Anne Milano Appel; Forewords by Umberto Eco and Carol Field. Farrar, Straus and Giroux, October 2009.